Dr. Michael Lieber comes from a distinguished family of musicians, scientists, intellectuals, and religious leaders. On his mother's side of the family, there were generations of rabbis, and the composer, Gustav Mahler, was a family member. Dr. Lieber’s father, Paul, was a distinguished scientist who made significant contributions to aeronautical engineering, hydrodynamics, and geophysics, with important implications for earthquake prediction, and who had among his friends, Hans Albert Einstein, the son of Albert Einstein. With this stimulating background, Michael became interested in science at an early age. At the age of 14, he developed, with the encouragement of his father, a cosmology which turned out to be similar to that of the esteemed paleontologist, Teilhard de Chardin. This cosmology of the young Michael became the inspiration for and guiding spirit of his later research in science. Having majored in science and mathematics in secondary school, he proceeded to the University of California at Berkeley. His formal studies concentrated on biology, social science and philosophy, while studying physics on his own. He graduated with a B.A. in anthropology. During his senior year at Berkeley, he wrote an original thesis on human evolution. It was very well received by the physical anthropologist, W. Howells. Through the writing of this thesis, he decided to pursue a research career in genetics. To be trained in such, he became a graduate student at the Institute of Animal Genetics, University of Edinburgh in Scotland. This Institute was under the direction of the world-renowned geneticist and embryologist, C. H. Waddington. During his stimulating studies there, Michael wrote a thesis on mutation, development, and evolution. Professor Waddington, referring to the thesis, said it represented very imaginative thinking. Michael completed his studies in Edinburgh, having received the postgraduate Diploma in Animal genetics, comparable to the American Masters’ degree. Michael then proceeded to the University of Sheffield in England where he studied for his Ph.D. under the direction of J. A. Roper, one of the pioneers of fungal genetics. His research on the genetic control of mutation in a fungus led to results very similar to those of the Nobel Laureate, Barbara McClintock. She had studied mutators in corn and was the discoverer of genetic control systems of mutation in corn, involving the so-called “jumping genes”, as coined by the press. After leaving Sheffield, he obtained a research position in the laboratory of Max Delbruck, a Nobel Laureate at the California Institute of Technology in Pasadena. In Professor Delbruck’s lab, Michael continued his research on mutation in fungi. Leaving Caltech, he obtained a position in microbiology at the Stritch School of Medicine, Loyola University, in Chicago. There, he investigated the mutagenic effects of the bacteriophage P1 on a bacteria genome, which led to some revolutionary discoveries, and which opened up a whole new sub-discipline of mutation research. In so doing, he also demonstrated that molecular explanations of certain phenomena pertaining to genetic change or genomic instability are very limited. 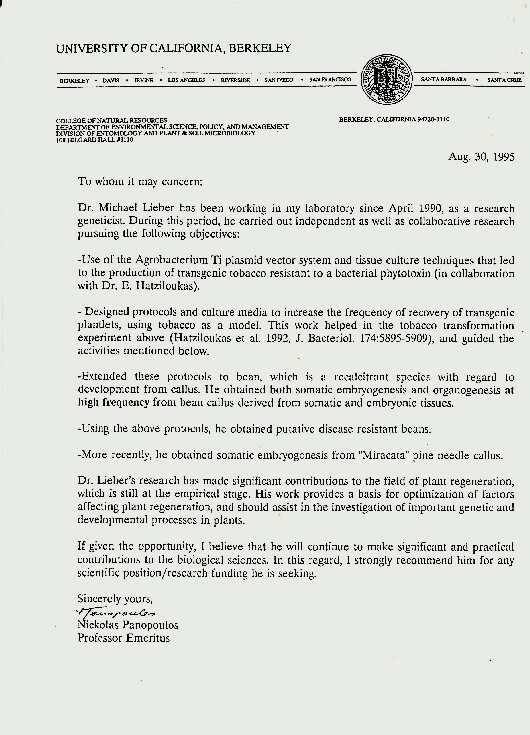 In this regard, Salvador Luria---a former collaborator of Delbruck’s---who also worked with P1, was the Ph.D. advisor of the person who directed the lab in which these new discoveries were made, and which demonstrated the limitation of the molecular or reductionist approach to our understanding of genetic mutation. Such an approach was the focus of Delbruck’s and Luria’s research in molecular and statistical genetics. By the way, James Watson, who predicted the correct structure of DNA, and who also obtained his Ph.D. under Luria, corresponded extensively with Delbruck on DNA’s structure. So, there is a bit of historical irony here in the history of science. 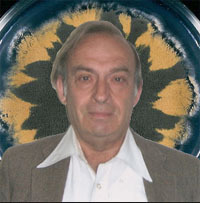 Completing his research in Chicago, Dr. Lieber returned to the University of California at Berkeley as a Research Associate in the laboratory of Alan Wilson, the distinguished evolutionist. In that position, Dr. Lieber continued to make important contributions, showing the significance of certain types of genetic mutators in karyotypic and morphological evolution, the later being based on karyotypic evolution. Since his early youth, Michael was always interested in horticulture and had acquired a great deal of expertise in the subject. Consequently, he wanted to enter plant-genetics research using plant-tissue techniques. He did so in the Department of Botany at North Carolina State University in Raleigh. There, he made important breakthroughs, overcoming recalcitrant organogenesis in the tissue culture of pine, an important step towards creating transgenic pine via tissue-culture methods. Returning to the University of California, he was a Research Geneticist in the Department of Plant Pathology. Again, he made significant contributions, among which, overcoming recalcitrant organogenesis in the green bean via bean callus, a neoplastic tissue. This approach was based on the application of a method stemming from a revolutionary cosmological theory described in some of his publications. Related to this, he was involved in the creation of important transgenic plants. He retired from a “hands-on-research” career, “at the bench”, but is still involved in various ways with research, exploring and writing extensively on various scientific subjects. He has a significant number of important publications to his credit, including two recent publications. In subsequent years, Dr. Lieber worked at the Center for Independent Living in Berkeley, an organization which helps disabled people become independent. Among his functions there, he assisted a homeless man in his lawsuit for malpractice against a county hospital. In the course of which, Dr. Lieber wrote in behalf of this man several motions for the court and wrote---with very little assistance---and submitted, two briefs to the California Court of Appeals, also in behalf of that man. One lawyer on the staff, referring to one of these briefs, said it was excellent. In preparing such legal materials, Dr. Lieber has acquired a great deal of legal experience and has demonstrated a facility for legal practice, essentially all self-taught. At this stage in life, he is even considering law school. In more recent years, he assisted at the U.S. Environmental Protection Agency. He was involved in a program that assisted Native Americans to maintain high-quality, drinking-water standards. In that capacity, he monitored and entered data using a complex database, edited documents, and made constructive recommendations that were appreciated. “At this stage in his career, I see Michael as creatively guiding and inspiring the research efforts of others, bringing to bear his depth of scientific experience and insight, as well as his empathy and integrity. “Michael has a mind that should not be wasted and future scientific progress would benefit greatly from the application of such a mind. 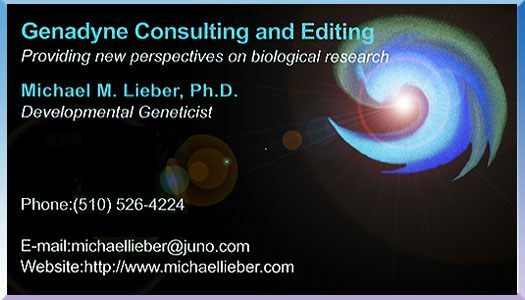 Dr. Lieber has had a broad and diversified career. Through such, he has come to appreciate the value and significance of his contributions to science, and thus to humanity. This has given him an inner stability and peace of mind, and a deep sense of his value, from which others have and will benefit. E. Hatziloukkas and N.J. Panopoulos. With technical support by Michael Lieber. Origin, Structure, and Regulation of ArgK, Encoding the Phaseolotoxin- Resistant Ornithine Carbamoyltransferase in Pseudomonas syringae pv. phaselicoia, and Functional Expression of ArgK in Transgenic Tobacco. Journal of Bacteriology, vol. 174 (1992), No. 18, 5805-5909. Lieber, M. M. (2006). 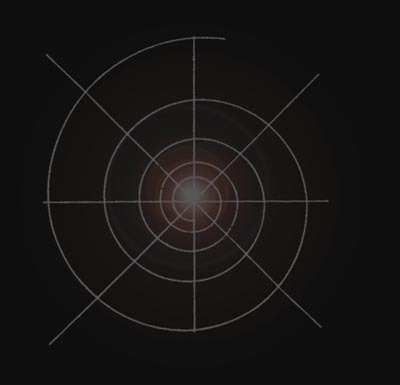 Bacteriophage Research: Its Deeper Significance for Science. Rivista di Biologia/Biology Forum, No. 2, 224-226. Lieber, M.M. (2010), A Fungus, Anastomosis, Diploids and Quantum Mechanics. Rivista di Biologia/Biology Forum, No. 2-3, 181-186. Lieber, M.M. (2011), The Problem of Antibiotic Resistant Bacteria. The Important Role of Environmentally Responsive Mutagenesis, Its Relevance to a New Paradigm That May Allow a Solution. Theoretical Biology Forum Vol. 104, No. 1, 91-102. Lieber, M.M. (2013), New Practical and Theoretical Approaches to the Induction of Morphogenesis from Plant Tumors In Vitro Using New Types of Plant Growth Regulators: Towards Constructive Paradigms in Agriculture and Medicine. Theoretical Biology Forum Vol. 106, Nos 1-2, 72-87.